Product information "Leatt DBX 5.0 All Mountain Jacket ink"
The new Leatt DBX 5.0 All Mountain is the new benchmark in hardshell functional jackets. Thanks to the 3-layer HydraDri material is both breathable and waterproof. It has a 20,000mm water column. The stitched seams and welded zips ensure that the jacket is waterproof even at the weak points. In addition, the jacket has large ventilation openings, which ensure that the jacket remains dry from the inside. The material was reinforced on the shoulders and elbows. Two large front pockets and a small pocket on the sleeve ensure that all important things can be stored directly on the body. The bag on the sleeve is especially practical. There, for example, the lift ticket can be safely stowed. 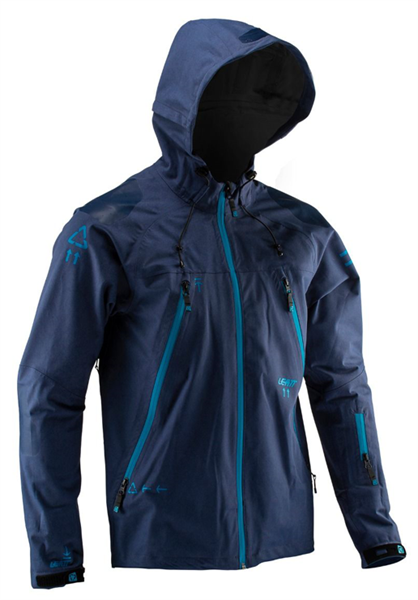 In addition, the jacket has a hood, which can be adapted just like the sleeves and the waistband with a cordelzug and a Velcro to your own needs. Related links to "Leatt DBX 5.0 All Mountain Jacket ink"
Customer evaluation for "Leatt DBX 5.0 All Mountain Jacket ink"